The Void is cold and empty. There is nothing between the stars. Any freight loader or void-mate who has ever made an inter-system run in a sub-light Scull knows the truth: you are truly alone in the void. You have all been told how safe Warp travel is. Administratum laud-hailers tell you this before every Jump. There is nothing to fear, or so they say. But everyone knows those are lies! The Warp is full and teeming with foul energies. It is an unending pool of horrors and danger. Have you heard the news about the Rivened Grace? A huge hauler, some 160,000 poor souls on board. Even had a detachment of brave, newly inducted Militars destined for the front. They made a routine Jump from this very system just 17 sols ago! And do you know where they are now? GONE! LOST! Dead? We can only hope they’re dead, for their sake. Do you what happened to them? They made the same mistake all of you are making. They trusted their Geller fields. They relaxed. They listened to the laud-hailers. And they were punished for their hubris! They were swallowed up by the foul immaterium. We spacers are but poor miserable wretches caught between the Void and the Warp. Death on one side, Damnation on the other. Close your eyes! Fill your lungs with this blessed incense. Empty your mind. Listen to the wheeze of the air filters, to the creak of the metal all around you. Do you feel it? Do you feel the warmth on the back of your neck? Do you see the inner light? Do you taste the Ozone and Honey at the roof of your mouth? I do! That is the holy Beacon, the Astronomicon itself! Some will tell you only witches and saints can see the Beacon. Only Soul-Bound sooth-sayers the blessed Navigantii. But they are lying to you! They don’t want you to know the truth. The truth is anyone, when truly moved by faith, can see the deafening light! We can all bathe in it’s glory. And we all must bow down before it! The Beacon is the God Emperor! The God Emperor is the Beacon! And we must lay ourselves low before his terrible and benevolent light! For with the Beacon we are never alone! Not in the Void, nor in the Warp! The hour of the jump approaches! The drive is already spinning up! So throw down your burden. Throw down your welder and your wrench. Throw down your ledger and signet-stamp! Join me and prostrate yourself before the Holy Beacon. We must pray to it, beg it to guide us. Let us sing and chant and beg for safe passage! May the great Beacon guide us! May the God Emperor touch the holy Naviganti! May our journey be true! The navigators of the splinter-house Merz-Itano are as varied and secretive as the house itself. For many years when a Merz-Itano nobilite would venture outside of their palace fleet they would do so only while wearing an antique void-suit, their true forms hidden behind faceless helmets and machinery. Now that Novator Lebbeus has mustered his forces for war and launched his inscrutable plans, more and more nobles and their exotic attendants have been observed moving freely outside of their cloistered ships. Aetherseer Lemura Kodom is possessed of an uncanny precognitory sight that rivals even her master’s. Her red warp-eye also allows her to peer directly into the souls of any who stand before her, and she relishes any opportunity to turn her gaze loose. When not meditating in her void sanctum, her withered body is carried on a bespoke mechanical walking rig and her warp-sight is enhanced by a Warp-Resonator Crown of unknown origin. Aethertwisters Praenat and Yume speak, think and dream as if they were a single entity. By entering a ritual hypnogogic state and combining their two warp-eyes with the their anchor-staff (containing the still living head of a mummified human psyker) they are able to absolutely triangulate their position in the warp, and therefore twist both reality and the immaterium around themselves. Doctor Paracelsus Takwin is a radical Genetor who is responsible for maintaining the arcane life-support devices needed to sustain Lebbeus and his family. Takwin was exiled from their home forge world for their unorthodox beliefs that the augmented human body is in fact the ideal form (far surpassing either the natural human or the unliving machine). In exchange for their medical services they are given access to the household’s Genetic Tabernacle and allowed to conduct their ongoing research unmolested. Lodge Warrior Laika was once a rad-shoveler toiling in the bowels of a decrepit cruiser. Born on the spaceways he had always heard the sermons of wandering Beaconite preachers, but never paid them much mind until his ship was caught in a warp-storm for 14 years. As the Geller field finally began to flicker out, Laika was granted a split-second vision of the blinding sound of the astronomicon. Before he knew it the vision was gone and the ship was back in real-space, safe and intact. An instant convert to the faith Laika’s devotion has won him entrance into the warrior lodge and his body has recently been upgraded by Doctor Takwin. Now he wields an ancient Aetheric Ray Condenser and proudly guards his beloved Navigatorii. You have really raised the bar with this lot. Absolutely inspired . . . . . . jaw dropping! Thanks! I’m really happy with how these turned out and now I feel like I need a newer better batch of henchmen to go with them. You already know this, but I’ll gladly repeat it: This is an absolutely fabulous army project — and arguably my absolute favourite 40k project around at the moment, period. There’s a look and feel to your army that is, at the same time, perfectly 40k and also completely your own. Extra kudos for fleshing out a relatively under-explored part of the lore! As for the new models, I really like how the Beaconite Pilgrim pushes the whole 20th century astronaut angle while also making it clear that the trappings of early void-travel have become something ritualistic and archaic during the 42nd millennium! The Procognicantriss, on the other hand, is so eerily creepy, yet also immediately recongnisably feminine at the same time. Marvelous work, as usual! Thanks Kraut! Always appreciated your support. You definitely get what I’ve been going for; part of the fun for me has been coming up with something that is both born of my personal tastes and interests and celebrates what I love most about 40k (in both background and aesthetics). I’ve got an abhuman Beaconite under way that pushes the astronaut imagery even further, but is still very dark millennium. A funny thing about the Prognosticantress; I didn’t originally set out to make her a woman. That particular push-mold of my master sculpted baby-face came out with especially fine features, but I had no gender in mind when I combined that face with the dress-like lower body. I had always planned to add a female navigator to the group and was happy to realize I had done so somewhat unintentionally. Wow, great work on them. The creepy doll faces work really well for the navigators. Thanks! I originally sculpted the baby faces to use on servitor-type constructs but loved them too much and decided to give them starring roles. 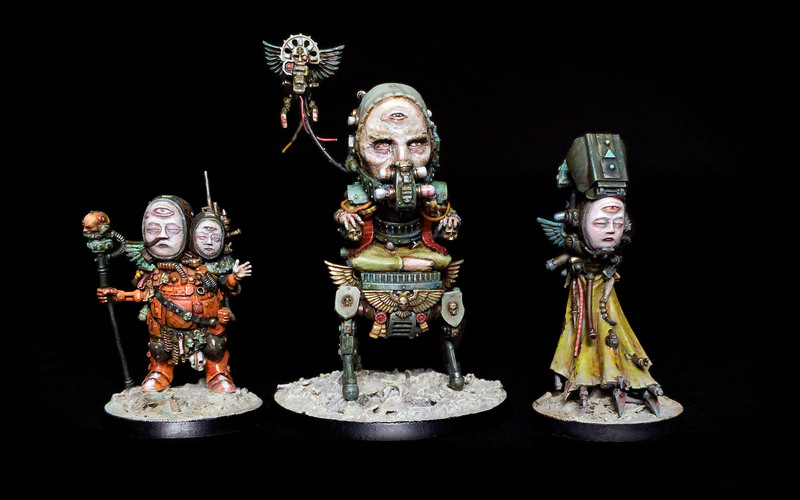 Hands down one of the most original 40k projects. I’m a great admirer of your work. thanks! I’m a big fan of your stuff and really look forward to see what you do next. Excellent! Pure genius! You can tell you’ve really enjoyed yourself on this project. Good on you and keep up the inspiring work. Thanks! Yes it’s been a lot of fun. Do you have another blog secreted away somewhere? Excellent work! I love what you did with this project, the feeling of otherness and antiquity that all the characters have, and how cohesive is their aesthetic. I found it very inspiring, so I made a digital illustration of Aetherseer Lemura Kodom, I hope you like it! Wow, that is very cool and fun to see! Thank you, I’m really glad you liked it!